I recently did an interview with a student working on her master's' degree as a parent of a child with diverse learning needs. I surprised myself at how much I had to say, considering my child is only three. What a journey it's been so far...and it's just the beginning! This isn't exactly riveting stuff...but this is our life! 1. What are your child's strengths/talents/gifts? Brandon, almost four years old, has such a unite little personality. He nonverbal at this time but we are hopeful that he will be able to communicate verbally soon. I can't wait to see what doors open for him when he is able to express himself more clearly. He is very adventurous. He loves knee boarding (yes, he's only 3! ), climbing, helping his dad mow the lawn, and indoor trampoline parks. 2. What are some of your child's challenges due to autism? Brandon faces challenges with communication. There are many ways we can communicate without words, but since his receptive language is also significantly delayed, communication proves to be extremely difficult. Sometimes I don't know why he is upset, which escalates the situation because he gets frustrated over not being understood. We can't always do things that typical families can do because of these limitations. 3. What are your experiences/beliefs/strengths/challenges regarding IEP meetings? We currently have an IEP through our local public school system, however, it is for walk-in speech therapy services only. Brandon attends a private preschool, although he does have the option to attend a public preschool with typically developing peer models. I don't send him to a private school due to lack of confidence in our local elementary school. The public school setting where I live only offers a three-hours-per-day program. This is typical in the public school systems. Since I work all day, I prefer for him to be in a school (rather than day care) setting for the whole day. He needs all the help he can get as we work toward our goal of a general education setting. I have been very fortunate in my IEP meetings. The vice principal and speech therapist there have been very supportive. I know there are horror stories about IEP meetings out there, but thankfully I haven't had any problems. They have been incredibly receptive to every opinion I have. I work to have wonderful relationships with all of Brandon's teachers and therapists. I tell them that I may be a little annoying, or come on a little strong, but it's only because I love Brandon so much and I want to give him his best chance. This has always been appreciated an applauded. 4. What supports/resources have you found beneficial to you, your child, and family? Before Brandon was diagnosed with autism spectrum disorder at two years old, he was diagnosed with developmental delays. So, he entered the early intervention system right away. 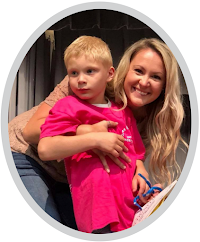 While we were in Tennessee's Early Intervention System (TEIS), Brandon had developmental therapy, speech therapy, occupational therapy, and Applied Behavioral Analysis (ABA), all at no cost to us. Now that Brandon has aged out of TEIS, he receives speech therapy through the public school system at no cost to us. We no longer have an official occupational therapist, although these skills are heavily worked on at his private preschool. We are incredibly fortunate in that ABA is covered by our insurance. Tennessee is one of only a few states who has yet to pass legislation to require insurance companies to cover ABA. It's so disheartening.. ABA, whether provided by his therapist during his session, or by myself using the techniques at home, has helped Brandon more than anything on this journey. 5. What has been your experience with educational support for your child in the academic setting? My experience for this question is minimal at this point, but what I can say is you need a great relationship between the parent and teacher so they can work together to help the child.